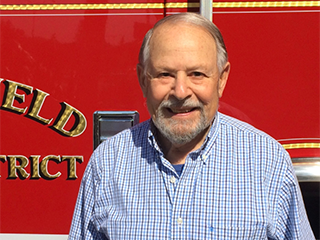 Kentfield Fire Protection District is governed by a five-member Board of Directors elected to four-year terms. The Board of Directors regular monthly meetings are scheduled on the third Wednesday of the month at 6:30 pm at the Kentfield Fire District located at 1004 Sir Francis Drake Blvd, Kentfield, CA. Agendas are posted on the website 72 hours in advance of the meeting. A Kentfield and San Anselmo resident for seventy years. Married for fifty years with three children. Mr. Evergettis’s career spans forty years in the heavy engineering construction industry. He is currently Director of the Kent Woodlands Property Association, Fire Safe Marin, Marin Ski Club , and Properties Committee for Marin Council Boy Scouts. Steven R. Gerbsman, a Kentfield resident for over 37 years, is a Crisis/Turnaround CEO/Professional and Private Investment Banker with over 43 years of senior management, marketing, sales and finance experience. Mr. Gerbsman received a BS degree in Accounting from Hunter College, New York and attended the Baruch Graduate School of Business, in New York City. A Kentfield-Greenbrae resident since 1978. Ron is a TV and Radio journalist in the Bay Area. As a reporter, he has a close working relationship with several local fire agencies and CDF. Kentfield and Greenbrae resident since 1948. Retail Hardware Store owner in family business since 1954. Member of Rotary since 1973. Resident of Kentfield’s Granton Park neighborhood since 1980. A former volunteer firefighter with KFPD. Insurance Broker in San Francisco. Director since February 1998.